A World War Two aviation mission drama, 633 Squadron consists of entirely familiar elements but flies with earnest intentions. In Britain of 1944, the British 633 Squadron flies De Havilland Mosquitos and carries out bombing missions across Europe against German target. 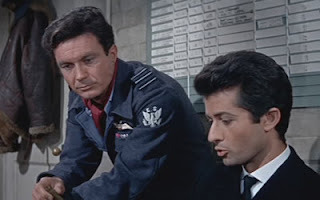 Under the leadership of Wing Commander Roy Grant (Cliff Robertson), an American volunteer pilot, the squadron has established a stellar reputation for getting the job done. Grant and his other pilots are recruited to train for a secret and difficult bombing mission in Norway. They are to destroy a heavily fortified Nazi fuel factory by toppling a protruding mountain ridge onto the enemy facility with a sustained bombing run. Norwegian resistance leader Lieutenant Erik Bergman (George Chakiris) provides the intelligence and works with Grant on planning the mission. Grant also meets and starts a relationship with Erik's sister Hilde (Maria Perschy). The intense mission training runs claim casualties, and preparations are further interrupted by a German attack on the British base. As the designated day of the attack approaches, Erik gets into trouble back in Norway and little goes according to plan. A British Mirisch Films production directed by Walter Grauman and loosely inspired by actual events, 633 Squadron is as basic as war movies get. Despite the plastic characters, wooden acting, inane dialogue, predictable heroics, implausible mission, and contrived romance, it's extremely difficult to not like the film: this is standard fare war action, honest in purpose, modest in scope and competent in execution. The film is enhanced by an above-average music score by Ron Goodwin, and the flying sequences, featuring a combination of real aircraft and model work, are for the most part accomplished. The in-cockpit scenes feature cringe-worthy backscreen projections, but otherwise Grauman frequently captures the majesty of the nimble Mosquito. As the first combat aviation film produced in colour and Panavision widescreen, 633 Squadron set the new standard for what is possible, and the visuals rarely disappoint. The pacing is also good. On-the-ground resistance action in Norway, the German attack on the British airfield, the dangerous training flights in Scotland and a precision bombing strike on a Gestapo building provide regular doses of action prior to the final bombing raid on the heavily fortified factory. The stirring attack includes Grant and his fellow pilots running a gauntlet of anti-aircraft batteries at low altitude, and served as inspiration for no less than George Lucas and the legendary ending of the first Star Wars movie. 633 Squadron also deserves credit for accepting a higher than typical casualty rate among the allied forces. Matching the reality of pilots during the war being drawn from throughout the Commonwealth, Grant's team is a diverse and multi-ethnic group, notably including a Sikh pilot. Cliff Robertson provides the volunteer American presence to increase the film's international appeal, but in general the characters are purely stock. Lacking in finesse but not in spirit, 633 Squadron gets the job done.